P(q) = scale*<f*f>/Vol + bkg, where f is the single particle scattering amplitude, appropriately averaged over the Schulz distribution of radii. Parameter (scale) is correlated with the SLD's that describe the particle. No more than one of these parameters can be free during model fitting. 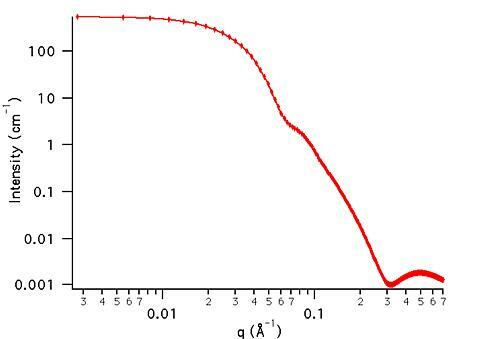 Parameter (polydispersity) is constrained to keep it within its physical limits of (0,1). If a value larger than 1 is entered that value is silently converted to 1 for the calculation. 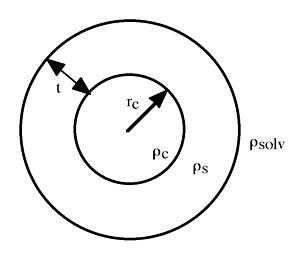 Polydispersity, p = s/Rc, where s2 is the variance of the distribution and Rc is the mean core radius, Parameter. For a more complete description of the Schulz distribution, see: J. Hayter in "Physics of Amphiphiles - Micelles, Vesicles and Microemulsions" V. DeGiorgio and M. Corti, Eds. (1983) p. 69.
and z is the width parameter of the Schulz distribution, . Setting the SLD of the core and shell equal to simulate a uniform sphere results in a mathematical (divide by zero) error, so if this occurs the difference is silently made equal to 10-10. To simulate a uniform SLD sphere, set the shell thickness to zero (the SLD of the shell will now make no contribution to the scattering). If the scale factor Parameter is set equal to the particle volume fraction, phi, the returned value is the scattered intensity per unit volume, I(q) = phi*P(q). No interparticle interference effects are included in this calculation. This function is useful for vesicles or liposomes by setting the SLD (core) = SLD (solvent), thus calculating scattering from a spherical shell with constant thickness, but polydisperse inner radius. Bartlett, P.; Ottewill, R. H. J. Chem. Phys., 1992, 96, 3306. This example dataset is produced by calculating the PolyCoreShell using 256 data points, qmin = 0.001 Å-1, qmax = 0.7 Å-1 and the above default parameter values.